This is the campaign log for the Twenty First session of a google+run Wandering Heroes of Ogre Gate campaign. The previous session is described HERE. I am running two campaigns in the same setting and treating them as occurring in different realities with some vague similarities. Characters in one may appear in the other, but there are no direct causal effects from one campaign to the next. Partly this is to playtest, but this is also partly due to the multi-dimensional aspect of the universe I run all my games in. It would theoretically be possible for the party from the Blood of the Demon Moon cult campaign to dimension travel to the Secret of Je Valley Campaign, in which case direct interactions could occur (and they could even meet their counterparts in the alternate dimension). Chen: A poisoner and healer known for his lazy ways. Prince Yuan: Son of the King of Li Fan, controls the eastern territories. Iron Spear Tip: A magic weapon with a mind of its own, the bride of Zhang Kang. 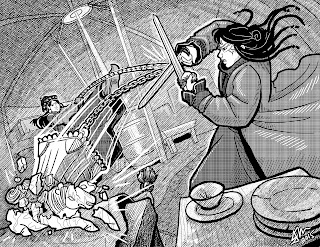 Last session, the House of Paper Shadows had hounded Bone Breaker, so he decided to deal with that before tending to more important matters (the invasion of Hu Qin and the Kushen developments). He then sent a message to Hu Gao, persuading him that the House of Paper Shadows had stolen wine tribute intended for him and instigating a conflict. The wine in question was highly prized Jade Wine, worth a small fortune. He later heard a rumor that Hu Gao went to their headquarters, The Shadow House, and never came out. To obtain lands south of Hai'an, Bone Breaker hired an actor named Han Qingzhao to impersonate him and head south with 50 soldiers and 6 martial heroes. He was instructed to make his way into the Suk lands and find an ideal location for a new compound or fortress. 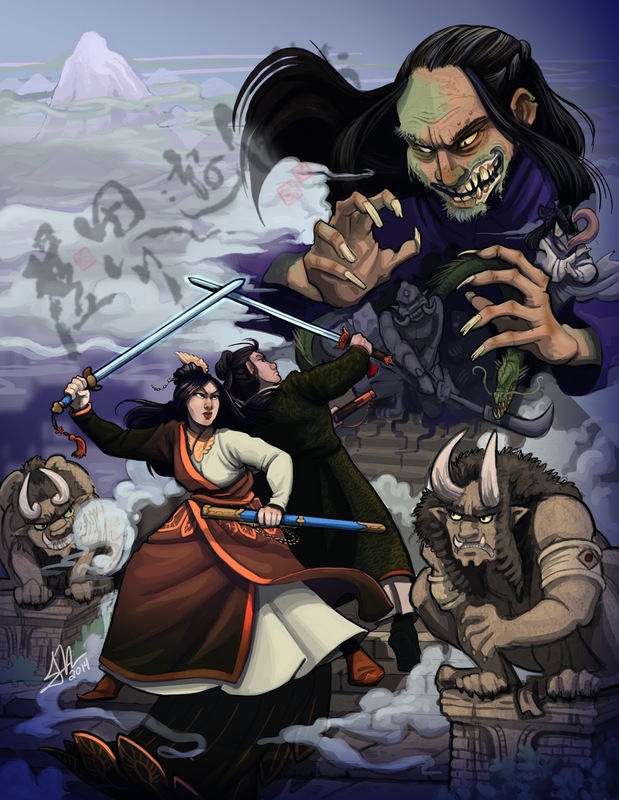 In the previous session, Bone Breaker was in Hai'an preparing to help them invade Hu Qin. This session he learned that his mole, Bronze Master (who was disguised as General Dee, the military leader of Hu Qin) had been discovered and had to flee. So he kidnapped their king then used his Dreams of Infinite Sky Realm technique to enter the dream of General Kang (Dee's successor) to convince him that the king was held by the Kushen in Li Fan. However this ploy failed, and he was forced to kidnap the general as well. He then had both brought to Li Fan and held prisoner in his fortress and instigated the Hu Qin army to head west to save their leaders. This allowed Hai'an to attack Hu Qin while it was not well defended, resulting in a quick victory. However, word reached Bone Breaker that the Kushen had met the Li Fan forces and crushed them, then decided to continue east and take Hu Qin themselves. The Hai'anese Generals were nervous, feeling they didn't have enough soldiers to withstand a Kushen siege. However the lead General informed Bone Breaker that the Queen would have them both killed if they failed. Bone Breaker went to the Kushen encampment at the border of Hu Qin and spoke with their leader, Ganbaatar. He negotiated a peace with the Kushen, who asked for 10 Million Spades tribute from Hai'an. He then took this news to the Queen, who agreed to pay. Under this arrangement, the Kushen would remain in Li Fan. While visiting the Queen in Hai'an, he obtained the land around Whispering Lake promised to Mr. Shan for Bone Breaker's help with the invasion. Mr. Shan was also given the title Duke of Whispering Lake. Bone Breaker then secured land for himself from the Queen he agreed to keep him secretly in her employ. Before he left, Bone Breaker ordered nine of his Silk Worm Assassins (former Flying Phantoms) to start finding and abducting members of the House of Paper Shadows. Bone Breaker brought the ten million spades to Ganbaatar, who allowed him to keep 1 million for himself. He then informed Bone Breaker that he was concerned for Chen and San, mentioning that his right hand man, Nergui, and his own daughter, Princess Sarnai, had gone with them to the Temple of Supreme Righteousness. He was unclear on the details but recognized the temple as a powerful threat. 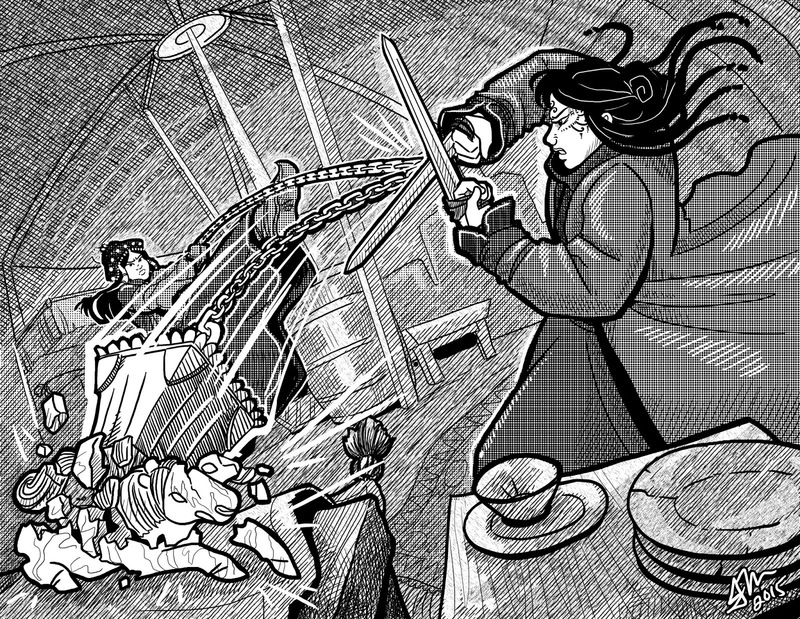 Bone Breaker sent Nuan to shadow them and act to aid his sister, San, if she was in danger. Inquiring about the situation in Li Fan, Bone Breaker learned that Chen and San had angered the local population by helping the Kushen take their land and enforce a heavy tax. He also learned that a woman named Xinyu, the estranged wife of General Dee, was likely organizing a group of local heroes against them. He decided to go and negotiate with her, hoping she might help him find a way to deal with the House of Paper Shadows. He went to her home on Snake Peak in Li Fan, bringing two experts with him: Madame Hurarui and Zheng Gong. According to his sources, Xinyu still kept up the manners and dress of a Hu Qin aristocrat. So he made sure to bring her appropriate gifts and used the experts for advice on addressing her correctly. On Snake Peak he found her and she invited him to speak on a cluster of rocks near her hut. There she summoned and pet swarms of venomous snakes. Bone Breaker assured her that the actions of his sister and sworn brother (San and Chen) were merely out of necessity and that he intended to help her deal with the Kushen invasion (though he may need to do so in secret in order to have maximum effectiveness). She was reluctant to take his word but over the course of the conversation, she came to trust him. They went over the various possibilities for dealing with the House of Paper Shadows, and she suggested hiring a sorcerer. They also discussed the possibility of finding a spy to join the House of Paper Shadows (preferably someone who was a known enemy of Bone Breaker). I just wanted to thank you and mention that your write ups of the two campaigns, but especially this one, are making my watching of old Shaw Brothers films on El Rey a lot more entertaining. Thanks! Thanks. I really wish we got El Rey with our provider.